In today's garment and textile industries, Heat Transfer Paper has become increasingly popular to print variety of designs on fabrics, mugs, cups, caps, metals, fiber, T-shirt etc. The thermal transfer paper offered by us is a specially designed paper that is used to transfer prints on other fabrics. Apart from garment industries, these papers find wide application in other sectors like screen printers & digital printers, advertisement, gift & articles, event management, sports, film and tourism. Only superior grade fibers are used for making these Heat Transfer Papers. 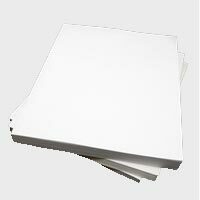 The papers are available in varied shapes and sizes as per client's specific requirement. A special type of chemical is used while making these types of papers. The Heat Transfer Paper can be digitally printed using inkjet or laser printers. Heat and pressure is applied to transfer the pattern or design on some other material. Fine quality of Heat Transfer Paper with excellent finish is offered to clients. Meeting all the standards of quality, these badges are provided in customized forms with changes in colors, logos and backgrounds. Please let us know your requirements and we are happy to serve you with proper detailing. We believe that, "Creation can take many forms and Buyers can also be Creators."